The students in the 1962 Girardot photo would feel right at home in today’s cafeteria. The room has been expanded. The addition is where the floor tiles change from the checkerboard pattern to plain at the column line. 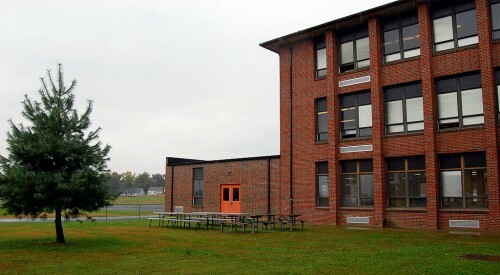 The one-story addition on the west side of the school is the enlarged cafeteria. 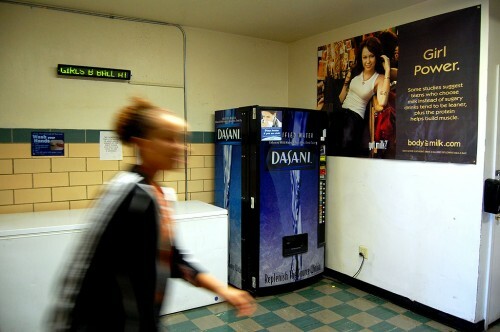 A Girl Power poster and a purified water drink dispenser grace the cafeteria lobby. I’d love to know how they’ve kept the floors and tile walls this shiny in a school that’s half a century old. Looks like fruit is available in addition to normal cafeteria fare. Don’t look too closely at the kids to see if you recognize anyone. One of the promises I had to make to be able to shoot in the school was that I couldn’t show any identifiable faces. I’m sure glad I worked in more innocent times. 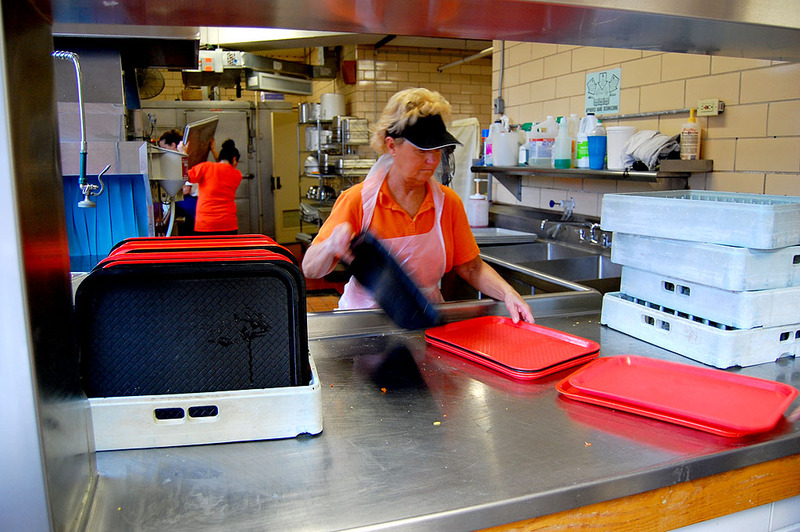 Once the hubbub in the cafeteria dies down, these are the folks who have to get ready to do it all over again. The food at CHS was really good. Portions were large and quite inexpensive, and somehow we managed to remain slim. I remember the ala carte selections were extensive. There was always the hamburger/hot dog duo, but after that we could have fried chicken, stuffed pork chops, turkey and dressing, roast beef, chili or soup, multiple veggies and salads, and great desserts. Recently I remembered the pineapple pie. I don’t believe I have seen it anywhere else. I still substitute in the district where I taught, and althought the lunches there are way better than other schools in our area, they don’t compare to CHS. Thanks for the comments of the CHS food in the 60’s. My mother was the cafeteria manager in the 60’s and 70’s. My aunt made all the pies, breads, cakes, etc. from scratch every morning. Mother decided she had had enough when they started bringing in all the pre mixed and precooked foods. 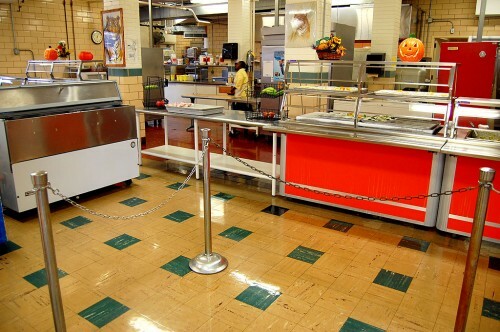 I always remember the food as being better than cafeteria food when i was teaching, but I ws afraid I was just biased! There was always the Type A lunch and then all of the ala carte items. Teachers always raved about the food and I think nearly all of them at in the cafeteria every day. Ken do you have any pictures of the cafeteria workers from those past days? Ruth Crites, Hilda Heise, Merle Kelly, Mary Lewis, and for awhile Ruby Brenan held down the duties. Charlie Clifford ran the dishwasher. Ken and Gary Fisher’s mother was the cashier at the ala carte line. 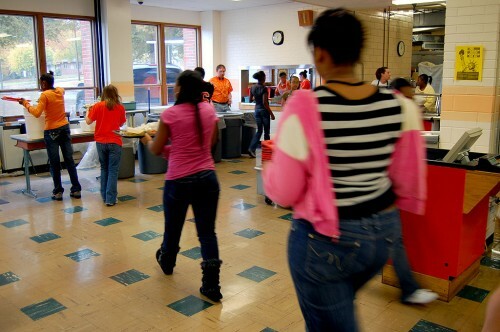 Let me poke around for cafeteria workers. I’m sure I have something. I don’t really plan what I’m going to post. I was looking through the Girardot to find a name for yesterday’s post when I spotted the shot of the kids in the cafeteria in 1962. That reminded me that I had the contemporary shots from last fall. I’m always looking for quick and easy content that doesn’t require a lot of research, so this was a natural. Had I been willing to spend more time on it, I’d have searched for more old pix, but yesterday was my lazy day. Now that you’ve put in a request, I’ll keep my eyes open. 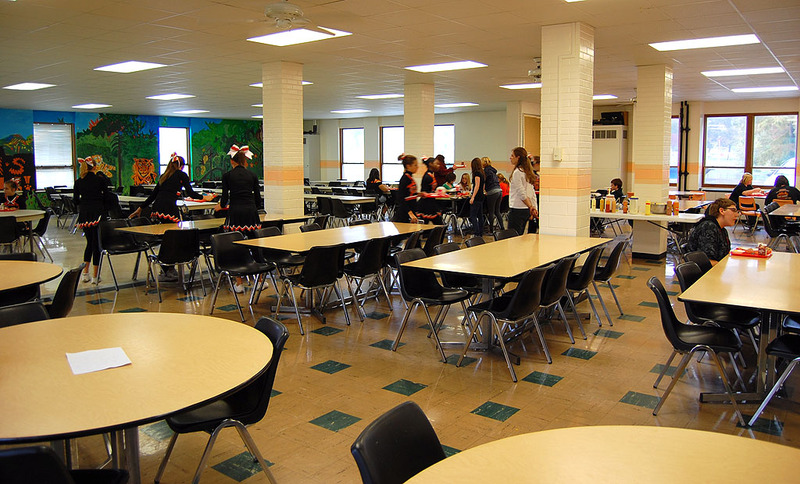 You can see that a lot of folks still remember their favorite foods from the cafeteria. Any chance you could come up with some of the recipes? fast flying trip to Wimpys, but I am sure that I had to have eaten in the cafeteria many times in those four years. Anyway, another great trip down memory lane…. Gary Schemel is sitting at the end of the table. like those old asbestos floor tiles are still in place! Same tiles. Just as shiny as the day when we were there. CHS cafeteria food was outstanding, as I remember. I explicitly remember a butterscotch brownie kind of thing that I’ve been trying to replicate or find ever since. Jerry has spent our 46 years of married life looking for a recipe for the French salad dressing served in the cafeteria. Anyone have that tucked away somewhere and would share it? These are great pictures, Ken. I recognize Kenneth McElreath, Jim Reynolds, Louie Loos and Gary Schemel. The girls are too far away for my eyes. In the 1962 photo, Bocky Bockhorst is at the front table in the middle of a bite. I’m making an identification from the back of their heads, but I believe that directly across the table from Bocky is Rich Kinder and to and Rich’s right is Jerry Jenkins. In front of the 2nd pillar is Bruce Berkbiegler and walking toward the kitchen with a tray is Patty Shelton. I had enough credits to graduate in January, but the school no longer allowed it so I had to find some things to fill in the day. I was a hall monitor near the music room and worked in the cafeteria during the lunch break, washing dishes. It didn’t pay anything but I got to eat whatever I wanted for free. It was hot work but I really enjoyed it. I remember the great chile they made there and one of the jokes was on Friday they had “Mistery Stew” which we all claimed was food left over from the week. Of course it wasn’t but we did start the rumor that it was! 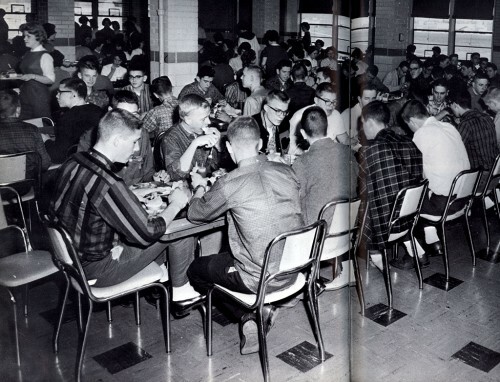 Great 1962 Cafeteria picture! It brought back some memories. Some others which haven’t been identified but I think I recognize, are John Schade to the left of Louie Loos, across from them, looks like it is Steve Moseley with his back to the camera and farther down the table, two to the left of Schade and facing the camera is Mark Campbell.